Rumer might lead the busy lifestyle of a singer, songwriter and Mum, but this doesn’t stop her from prioritising time with her adorable pooch Alfie! This month Mayhew interviewed Rumer to find out how she spends her days with her furry pal, the animal adoption process and the effects that animals have on mental health. Is Alfie your first dog? I grew up around animals. We always had family dogs, but Alfie is my first very own dog. We weren’t really sure how old Alfie was as he came from a rescue home. He was about eight or nine months old when we got him, as you can tell by their teeth. So I think Alfie is about five now. How does Alfie fit into your busy lifestyle? I always make time for Alfie. I am the one who spends the most time with him. I have a lady who comes and walks Alfie and makes sure he is nice and tired when I am not there. He gets treated like a baby, as he doesn’t get left alone ever. I remember I left him once to go to a restaurant and when I came back he had gone through the rubbish bin and I never forgave myself! He does restrict my movements somewhat, but I just think if I can’t take Alfie, then I don’t want to go. I will always try and find a restaurant where I can take him. I would just rather be with him! What do you love to do with Alfie? We love to go on walks. He absolutely loves the parks in London, especially because I can take him off the leash. In America, there are also some lovely walking trails. Sometimes we hike the canyon trails. He loves it. What would you say to people thinking about buying or rescuing an animal? I have lived in America for some time now and can see the differences between the United Kingdom and America in terms of animal adoption. The UK has so many different breeds and it is still possible to buy puppies from pet stores and breeders. Whereas in America this is frowned upon as there are so many shelter dogs that are in need of a home. I can understand why people may want to get a certain type of dog because you don’t really know what kind of dog you are going to get at a shelter. However, what I think people don’t realise is that you can still get a breed of dog at a rescue home; from a pug to a greyhound or a spaniel! And of course lots of wonderful cross breeds. I would really like to see people making more of an effort to get a rescue dog. I just think that sometimes people buy a breed simply because it is fashionable without realising the responsibility that comes with that breed. I think this is really irresponsible. For example, many people don’t realise pugs or French bulldogs have breathing problems and that they live their lives in discomfort. It is World Mental Health Day on 10 October – do you believe that dogs and animals help to reduce stress and anxiety? Absolutely. I think that simply being around living things that are indigenous to the planet helps improve our quality of life. I think the exchange of touch, affection and company are really important for wellbeing. I also think having a dog helps to combat loneliness. Loneliness affects people greatly and can have quite a serious impact on your health. I think we could do with some more research to strengthen the fact that animals do help with overall wellbeing. Do you think Alfie helps with your wellbeing? I feel as though Alfie has changed my life. I used to suffer from anxiety and I felt that he kept me grounded. Animals give you unconditional love, especially in a world where that can be hard to find. It is nice to be appreciated all the time, and have someone always there to greet you. I also think it motivates you to get out and about whatever the weather and meet people. I think they are the greatest animal on the planet! 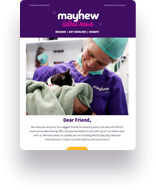 If you are considering getting a pet, please think about going to a rescue shelter like Mayhew where there are lots of beautiful animals looking for a place to call home. To view our cats and dogs waiting for their forever family, please visit here.